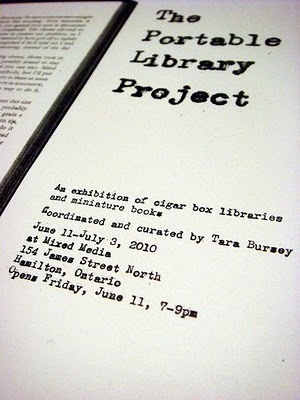 The Portable Library Project is coming to Mixed Media in Hamilton. The show opens this Friday evening, and runs until July 3. I am glad that the show is happening a little closer to home, so I will actually have a chance to see all of the other talented artist's work. Check out the show if you can! For more information, click here.